OnePlus 6T to Feature 3,700mAh Battery - Playfuldroid! The OnePlus 6T will remain under the wraps until its rumored launch on Oct. 17. The recent renders of the OnePlus 6T by @OnLeaks have revealed the entire design of the phone. The handset is expected to arrive with a refreshed appearance and it is likely to include almost the same specs as the OnePlus 6 phone. Fresh information reveals one hardware improvement that will be arriving on the OnePlus 6T is the inclusion of a larger battery. A leaked photo of the battery that reportedly belongs to the smartphone reveals that it will be equipped with a 3,700mAh capacity battery. 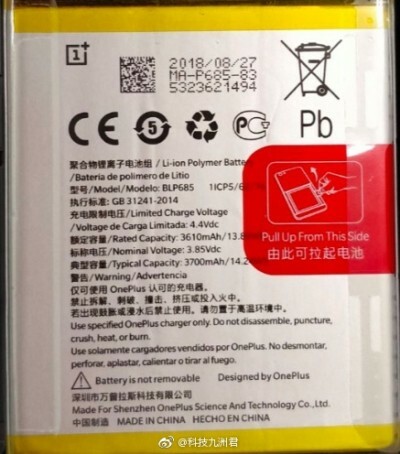 The OnePlus 6 has a 3,300mAh battery. The presence of 3,700mAh battery on the upcoming OnePlus 6T phone means that it will be offering 10 percent better battery life. Like the other OnePlus phones, the OnePlus 6T will come equipped with Dash Charge technology. The other improvement arriving on the OnePlus 6T is the inclusion of an in-display fingerprint scanner. Sadly, the smartphone will not be featuring a 3.5mm audio jack. There is no information available on the specs of the phone yet, but it is speculated to arrive with 6.4-inch waterdrop display, Snapdragon 845 chipset, up to 8 GB of RAM, up to 256 GB of storage, 16-megapixel front camera, 16-megapixel + 20-megapixel dual camera and Android 9 Pie OS with OxygenOS 9.